Prime members head to Amazon and order the Black & Decker Electric Carving Knife for Only $11.29! (Reg. $19.99) Shipping will be FREE for Prime members! What would the holidays be like without a sharp knife slicing through hot turkey, ham or brisket? To cut perfectly sliced meats is effortless with the Black & Decker Slice Right Electric Knife series. 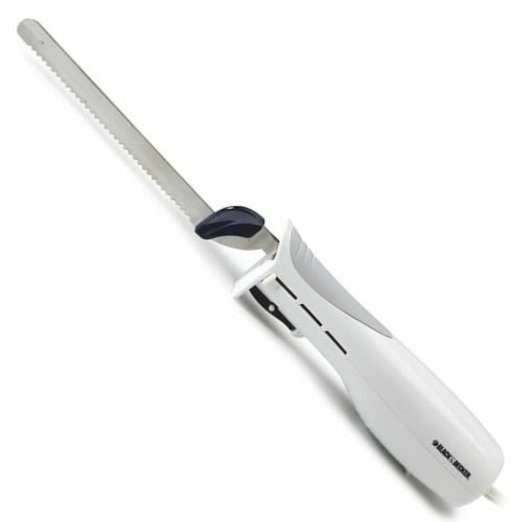 It has a safety lock that prevents accidental starts, and a comfortable handle with non-slip grip.The serrated part of the knife measures 7” but there is a 2” tang before the plastic safety guards allowing up to 9” carving!